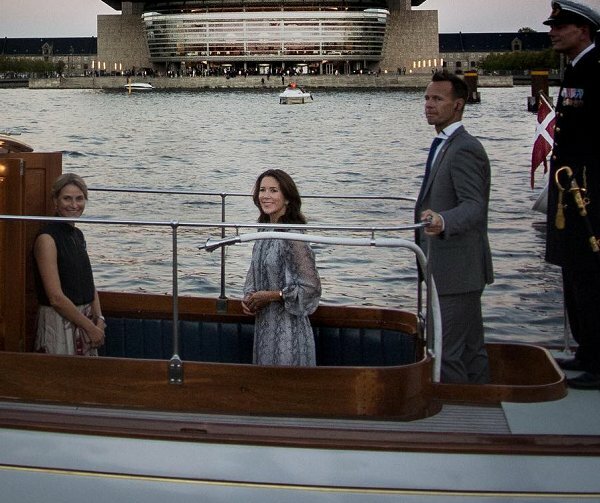 Yesterday, on September 13, Crown Princess Mary of Denmark bearing the title of being the patron of WHO Europe Regional Committee meeting attended a reception at Copenhagen Opera House, which is in connection with the meeting of Europe 66th Regional Committee. 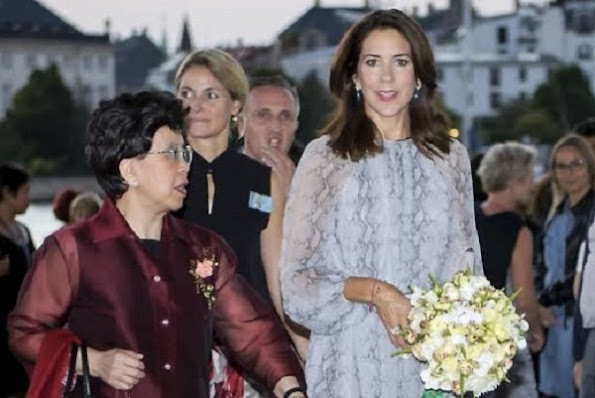 At the reception, Crown Princess Mary wore a Zimmermann Seer Snake Dress. Crown Princess wore that dress first at the baptism of Countess Ingeborg held at Copenhagen Holmen Church. Zimmerman Seer Snake Dress retails for $625.00 on SHOPBOP website. The Crown Princess wore a Gianvito Rossi Pump. A longish dress is so much more elegant than the ever shorter ones we see on the 'royals' these days. Kate, DOC, getting out of a car showing a lot of thigh is unbecoming, royal or not. Not a fan of the snake look but she looks elegant as always. I feel pain when seeing her heels and picture of boat. Wearing heals with this nightgown won´t turn it into a dress. @Vanessa, You are so right. My nightgowns even more elegant than Mary's dress!